While most business training programs are designed to keep your organization moving, ours are meant to take it where it needs to go. We’ll help you turn your managers into leaders and help your teams win more often. With training workshops from Krissi Barr, you’ll get the smartest, most practical ideas presented with impact to ensure takeaway value. Topics include leadership, strategic planning, strategic thinking and decision making, communications and sales. Whether your training need is in Cincinnati or anywhere in the world, trust Barr Corporate Success to deliver. 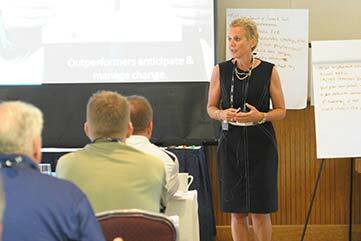 Training workshops from Barr Corporate Success are advanced, personalized and interactive. And because Krissi Barr is involved they’re also fast paced and fun. The training workshops for leadership, strategic thinking, sales and mindset management help individuals and teams see new opportunities and capitalize on them. Your team will not only absorb new ideas, they’ll develop the skills needed to put them into practical use. Based on the core lessons from her book Plugged, Krissi shows how the acronym PAR turns workplace frustration into a proven process for producing winning results. This training program can be applied on many fronts: team building, leadership, personal challenge, sales, strategic planning and implementation. The workshop focuses on one cornerstone idea: shoot for PAR. All too often, people find themselves busy doing activities that aren’t tied to the most important things they want—or need—to accomplish. With a training workshop from Krissi Barr, anyone can learn how to dig out and get the right things done! Leadership separates the good from the great. Based on the core lessons from her book The Fido Factor, Krissi trains the class on the leadership in a way that’s both relatable and memorable. Participants will learn how to be the leader their dog would be proud of…and their boss. The central message is how dogs–and great leaders–live the values of FIDO. This isn’t a cute little training session about puppies. Its a serious journey to leadership success…with dogs just hanging their heads out the window and enjoying the ride. This program teaches people how to coach themselves, their team and customers. The focus is on behaviors and conversations proven to gain a competitive advantage and drive results. The quality of work relationships and results depend on the quality and effectiveness of conversations. 4S™ can be used for strategic planning, coaching, problem solving, customer planning and other conversations. Fundamentally, there are two types of conversations: those you have with yourself and those you have with other people…including co-workers. Using real cases based on situations that participants regularly encounter, people leave the program with tangible solutions. 4S™ is applicable to all levels in the organization from senior leadership to individual contributors. The program also includes developing leadership skills around the building trusting, high-performance relationships to get better results faster. When you want to train your team, call Krissi Barr. Her training workshops will connect with your people and deliver powerful information with critical takeaway value. Need help getting the right things done? Let’s get to work.